"And when Sam heard that he laughed aloud for sheer delight, and he stood up and cried: 'O great glory and splendour! And all my wishes have come true!' And then he wept." 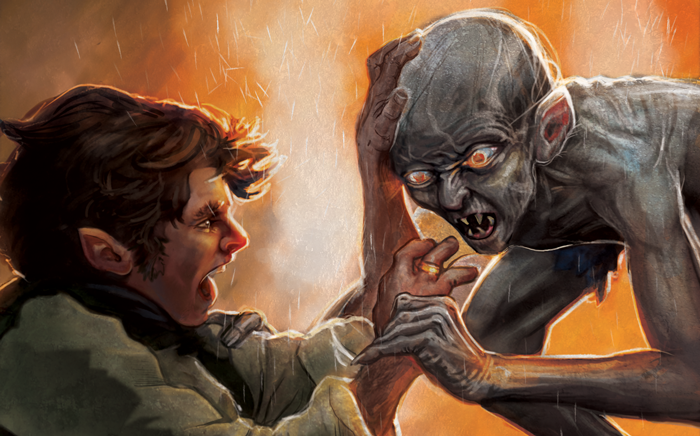 When The Mountain of Fire Saga Expansion for The Lord of the Rings: The Card Game makes its way to a retailer near you, it will mark the end of an age. 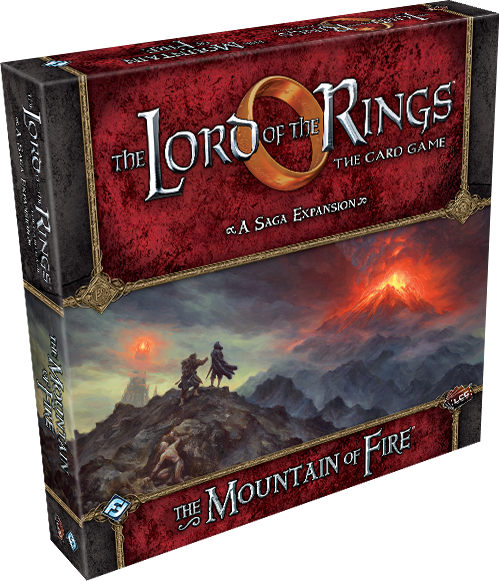 The Mountain of Fire is not the end of The Lord of the Rings: The Card Game, but it is the end of your Saga Campaign. You will, at last, be able to conclude your journey through The Lord of the Rings Saga Expansions that you began with The Black Riders. And you will, at last, be able to see how the decisions you made in that Saga Expansion's scenarios, as well as those you made in the Saga Expansion that followed, have shaped your campaign—positioning you either to successfully destroy the One Ring… or to succumb to the many threats that mark the lands of Mordor. And as far as conclusions go, The Mountain of Fire is an epic and rewarding thrill ride, flush with all the apocalyptic perils and legendary heroics you'd expect from the end of Middle-earth's Third Age. It also represents years of planning, development, testing, and love. The expansion—like the whole of the Saga Campaign—was developed with the deepest of appreciation for Tolkien's fiction, the world it invented, and the characters who inhabit it. 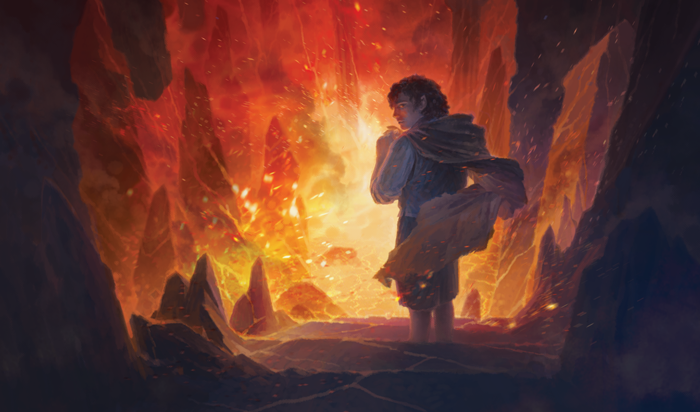 This love of Middle-earth is integral to the story of The Mountain of Fire, and in today's preview, developer Caleb Grace explains why it matters. I love The Lord of the Rings. I have loved it ever since I was a child, and I never get bored of it. I love the characters and the languages. I love the beauty and danger of Middle-earth. I love the story and how it grows with the telling, and I especially love the ending. Sam’s delight after finishing his quest is palpable in The Field of Cormallen. And the completion of The Lord of the Rings: The Card Game Saga Expansions is also a wish come true. 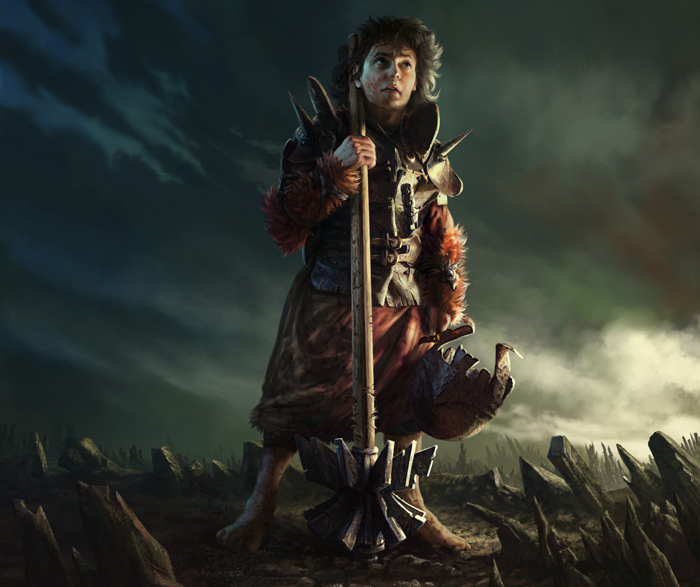 When The Mountain of Fire Saga Expansion is released, it will mark the end to a journey that began five years ago in a coffee shop when Christian T. Petersen shared with me his vision for Campaign Mode in The Lord of the Rings: The Card Game. We discussed a series of products wherein the result of each game would affect the next scenario, and players would feel like they were part of an epic adventure alongside Frodo and the rest of the Fellowship. At the time, the idea was unlike anything that had ever been attempted in a cooperative card game. When I got back to my desk, I created an outline that included eighteen scenarios to be released across six Saga Expansions, along with all the heroes, boons, and burdens that would go with them. The result was a road map that would take us from the initial work on The Black Riders Saga Expansion in 2012 all the way to the release of final saga box in 2017. And now that we’re here, I’m amazed at how quickly the time went by—and at how fully we were able to accomplish everything included in that original document. Of course, it’s important for an epic adventure to end well. If the ending is disappointing, it can leave you feeling like everything that led up to it was a waste of time. That’s just another reason I love the ending of The Lord of the Rings so much; it’s incredibly satisfying! And it was critical to me that The Mountain of Fire would provide the same kind of satisfaction to everyone who joined us on this adventure. That is why we mapped out the entire saga so far in advance. Everything we’ve developed has been building to this point. 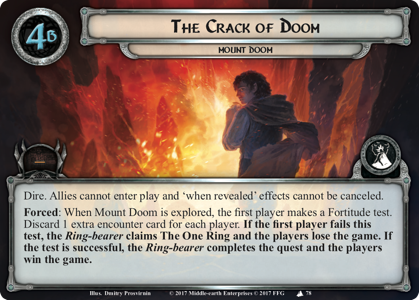 Players won’t know the full weight of their decisions until they reach the The Crack of Doom (The Mountain of Fire, 78) and make that last Fortitude test to determine whether or not they destroy The One Ring. In that moment, everything the players have been striving for across eighteen adventures will reach a conclusion. Every boon, every burden, every decision will be boiled down to a single instant. This is what the entire campaign has been building to! To help you understand the significance of this moment, I should explain how Fortitude tests work. These tests represent the Ring-bearer’s determination to complete his quest despite the unbearable physical and emotional strain it placed upon him. When you are instructed to make a Fortitude test, you choose to exhaust any number of ready heroes you control in order to commit them to the test. Then, you discard the top X cards of the encounter deck, where X is the tens digit of your threat. 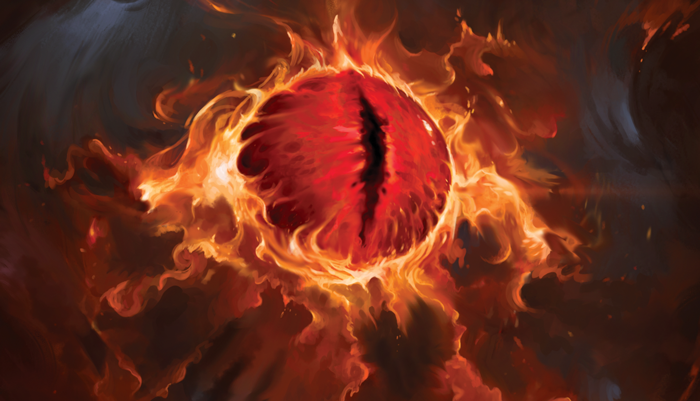 If the total Willpower of the heroes you committed to the test is greater than the number of Sauron’s Eye icons discarded from the encounter deck, you successfully pass the test. But if the number of Sauron’s Eye icons is equal to or greater than the Willpower committed to the test, you fail the test and suffer the consequences. Here, at last, we have the corrupting influence of the One Ring given real weight along your final steps to Mount Doom. Ultimately, the consequence of failing the Fortitude test at The Crack of Doom is to fail the quest and lose the game, but success means destroying the Ring and defeating Sauron for all time. This design is meant to replicate the climatic moment from The Return of the King where Frodo finally reaches the chamber where the Ring was forged, the only place where it can be unmade, and he wrestles with the decision to destroy it. The tension in that scene is nearly unbearable, and I wanted the climax of the Saga Expansions loaded with that same tension. That is why I knew from the beginning that it would all come down to a single test. Of course, you cannot make the final test until after you reach Mount Doom, and that will not be easy. First, you must rescue Frodo from the Orcs in The Tower of Cirith Ungol, and then you have to buy the Ring-bearer time to complete his journey by sending other heroes to lead the Free Peoples against the endless hordes of Mordor in The Black Gate Opens. In each of these scenarios, you have the opportunity to make the last leg of the Ring-bearer’s quest either easier or more difficult. In The Tower of Cirith Ungol scenario, as in the book, several valuable items are seized by the Orcs when they capture Frodo. So in campaign mode, during setup, your fellowship must set aside an Item boon, placing it out of play. 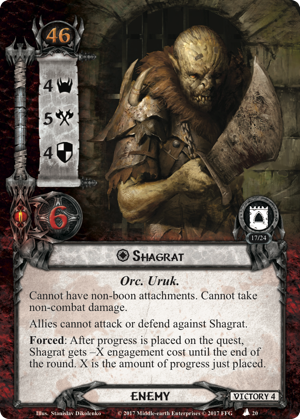 When the Orc captain, Shagrat (The Mountain of Fire, 20), is later added to the staging area, each of the set-aside Item boons are attached to him as guarded objectives. In the book, Shagrat fled Cirith Ungol with several important items belonging to Frodo because Sam was unable to stop him. There's a risk of this in your Saga campaign, as well. If you want to get your Item boons back, you will have to defeat Shagrat, otherwise those boons will be removed from the campaign pool at the end of the scenario. 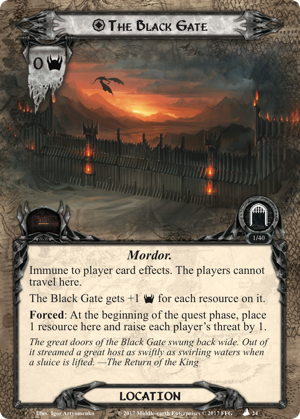 In The Black Gate Opens, you are confronted with overwhelming odds as The Black Gate (The Mountain of Fire, 24) causes an increasing number of encounter cards to be revealed each round. You're certain to have your hands full in short order; by round four, the first player of your group will be revealing no fewer than four encounter cards. 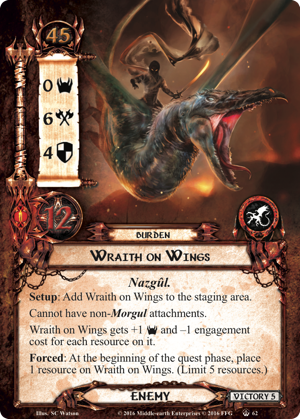 To make matters worse, each player adds a Wraith on Wings (The Flame of the West, 62) burden enemy to the staging area when setting up the scenario in campaign mode. However, this is yet another opportunity to aid the Ring-bearer: Each Wraith on Wings that is in the victory display at the end of the scenario is removed from the campaign pool. That means that if you can defeat a Wraith on Wings, that burden enemy will not be added to the staging area when you set up the final scenario. As a result, there's weight and tension in every moment of your adventures in The Mountain of Fire, and the tension doesn't begin when you face your final Fortitude test; it builds toward that climactic moment. Even though the outcome of your entire campaign rests on that one, final test at The Crack of Doom, you have many opportunities to help the Ring-bearer along his way, and you'll see the moment looming well before you get there. It is my hope that this rising action—all directed toward the last, final, climactic test—gives you a real sense of satisfaction as you reach the end of your campaign, and I hope you enjoy the conclusion as much as I did. While the Captains of Gondor and the armies of Mordor prepare for an apocalyptic, world-shattering battle outside the Black Gate, the fate of Middle-earth's Third Age hangs precariously by a thread. The soft, padded footsteps of Frodo Baggins go almost unheeded as he ascends the path to Mount Doom. Will he hold up his Fortitude? Will he destroy the One Ring? What aid can you lend him to see him succeed in this monumental task? Prepare yourself now for the final chapters of your epic Saga Campaign. Head to your local retailer to pre-order your copy of The Mountain of Fire (MEC62)!